Thermostatically controlled with override switch option. Supplied with a 5 mode shower handset, slider and hose. Requires a minimum of 0.5 bar of pressure. Brass body chrome finish. Fittings included. 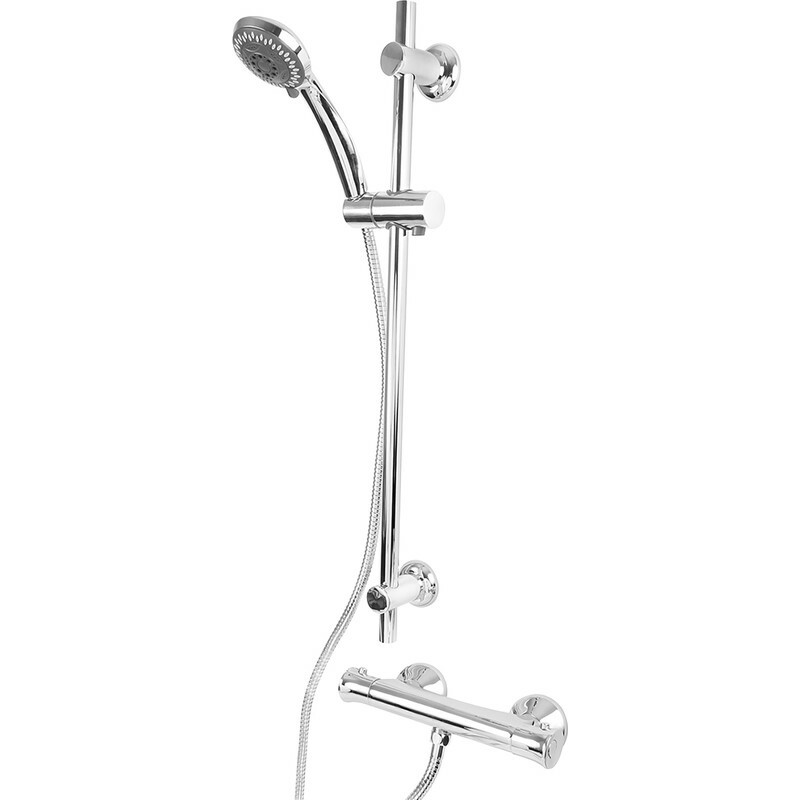 Rainbow Thermostatic Bar Mixer Shower Valve & Kit is rated 4.1 out of 5 by 12. Rated 1 out of 5 by Gmc1 from Only lasted 15 months. Shower cartridge faulty after 15 months. Only comes with 12 months guarantee .should state this in catalogue. Rated 1 out of 5 by Hammy67 from Disappointed I bought this to put in to my new shower. The bathroom was only finished two weeks ago but the rail slider has already broken. I dont want to replace the whole shower so have had to purchase a new rail. Rated 4 out of 5 by Sumsim from Easy to use Bought this for my mum and I did it myself by removing the old valve and fitting in the new. It was easy to fit in and it works perfectly, now she can enjoy a lovely shower. Rated 5 out of 5 by Buildeco from Great value I needed only the valve to replace a similar style one from another manufacturer. This was the most economical solution as it was on special offer. Fitted easily and I am using the original hose, rail and handset so I now have a spare set. Works well and I am hoping it will prove to be durable. Time will tell. Rated 4 out of 5 by Bandit60 from Excellent value Bought for a client as a quick and inexpensive replacement ,they were delighted with the cost and quality. Rated 5 out of 5 by Toolstation7878 from Great value Really impressed with the quality for the price. Not been in long enough to comment on reliability.